I recently bought your plugin and I must say I am impressed. An elegant system for online bookings that your customers will love. Your clients will see only available seats at specific times, and if it's available will be able a table reservation. 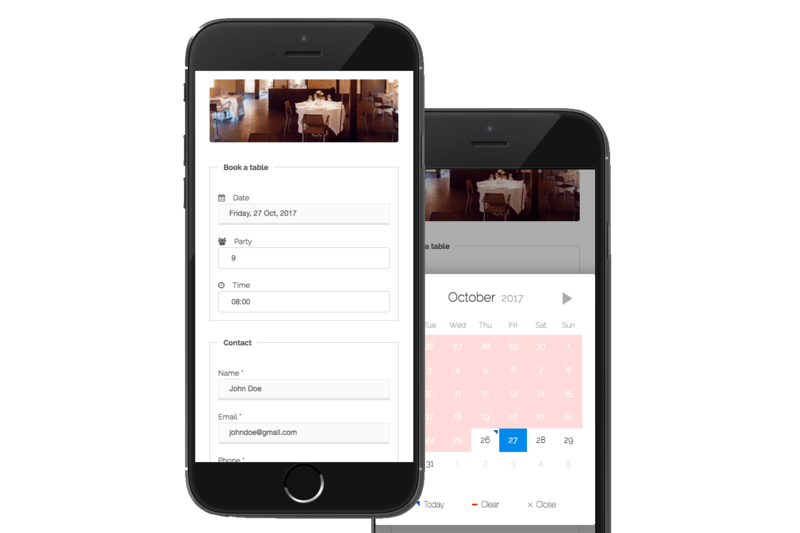 Manage bookings for unlimited restaurants and receive notifications to different emails. Filter your bookings from the dashboard and quickly confirm/reject them with a click. Automate and organize the reservation process with specific rules applied to each restaurant. Create responsive menus for every device. Manage the image, title, description and several prices for every menu item. This handy Drag & Drop builder lets you create and move your menu items in a very easy way. Manage rows, columns, sections, food tags and nutrient facts all from the same page. This handy feature lets you create and move your menu items in a very easy way. Each menu item is editable inside a popup window with title, image, description & prices. Create up to 3 columns and group your menu items in sections inside. Manage also different rows with dropdowns for displaying several menus in the same page.